March 2019 coverage was up 25% from February 2019, and nearly doubled from the amount of media attention to climate change or global warming in March 2018. March 2019 coverage was up 5% in Africa, up 9% in Oceania, up 19% in Asia, up 27% in the Middle East, and up 48% in Central/South America compared to the previous month. Among monitoring at the country level, coverage increased 4% in Australia, 10% in Germany, 12% in the United Kingdom (UK), 17% in Canada, 20% in India, 21% in New Zealand and 25% in the United States (US). Among the four wire services we now monitor, there was a 55% increase in March 2019 coverage of climate change or global warming from February 2019 coverage, and nearly a doubling of coverage from March 2018 levels. 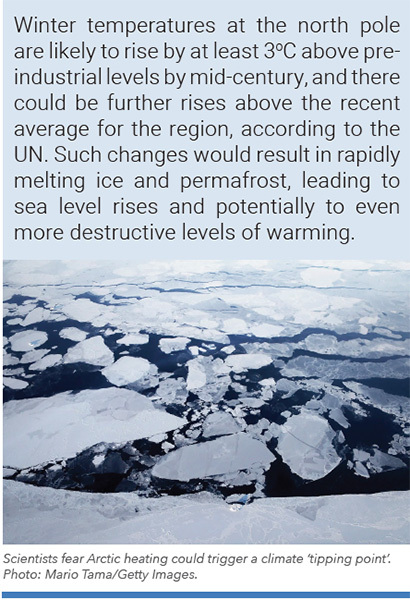 March media attention to climate change and global warming increased in all regions and all countries monitored throughout the world from the previous month of February. Figure 1 shows increases and decreases in newspaper media coverage at the global scale – organized into seven geographical regions around the world – from January 2004 through March 2019. Figure 2 shows word frequency data in thirteen Spanish- and Portuguese language Latin American newspapers in March 2019. 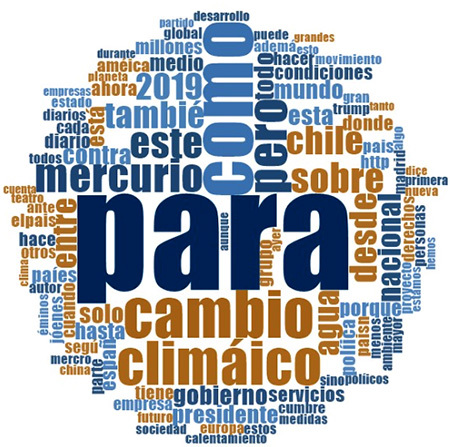 Data are from searches of the terms ‘cambio climático’ or ‘calentamiento global’ in twelve sources in El Universal (México), Reforma (México), La Nación (Costa Rica), El Comercio(Perú), El Comercio (Ecuador), El País (Uruguay), La República (Uruguay), El Tiempo (Colombia), La Razón (Bolivia) La Nación (Argentina), El Nacional(Venezuela), and El Mercurio (Chile), and from ‘mudanças climáticas’ or ‘aquecimento global’ in O Globo (Brazil).Of note, in these searches across thirteen sources in ten countries – México, Costa Rica, Brazil, Venezuela, Colombia, Bolivia, Perú, Uruguay, Argentina and Chile – ‘Trump’ was just the 63rd most frequently invoked term across the 182 articles in March. 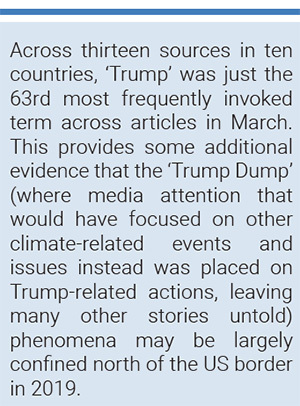 This provides some additional evidence that the ‘Trump Dump’ (where media attention that would have focused on other climate-related events and issues instead was placed on Trump-related actions, leaving many other stories untold) phenomena may be largely confined north of the United States (US) border in 2019 (a mention every fourth article on average contrasted with approximately five mentions per article in the US press). Also, in March 2019 coverage of climate change or global warming in these sources went up 48% from the previous month of February 2019. Coverage also doubled in these sources in March 2019 from March 2018. Moving to considerations of content within these searches, in March ecological and meteorological connections to climate issues populated overall coverage. For example, record-setting flooding in the US – particularly in the Midwest states of Wisconsin, Iowa and Nebraska – was covered, many stories making links to flood events and a warming world. For example, John Schwartz from The New York Times wrote, “Vast areas of the United States are at risk of flooding this spring, even as Nebraska and other Midwestern states are already reeling from record-breaking late-winter floods, federal scientists said on Thursday… More rainfall in the Midwest is a predictable consequence of climate change, according to the most recent National Climate Assessment, which was produced last year by 13 federal agencies. A warmer atmosphere can hold more moisture, which comes down as precipitation. Also in March, an East African cyclone named ‘Idai’ – with damage most concentrated in Mozambique – prompted further articulations in media accounts of links between extreme events and a changing climate. Journalist Ruth Maclean from The Guardianreported on Monday, March 18 that Mozambique President “Filipe Nyusi told Mozambican radio he had seen ‘many bodies’ floating in the overflowing Pungwe and Busi rivers. “It appears that we can register more than 1,000 deaths,” he said, adding that more than 100,000 people were at risk because of severe flooding. At least 215 people have been confirmed dead and hundreds are missing across Mozambique, Malawi and Zimbabwe from Tropical Cyclone Idai, according to government agencies and the Red Cross, which said 1.5 million people had been affected.” Furthermore, journalist Jeffrey Gogo from The Herald in Harare, Zimbabwe observed, “On March 15, Harare woke up to some light winds in overcast conditions – as per the MSD’s [Meteorological Services Department] predictions. It drizzled in a few places. But it is the high risk areas such as Muzarabani or Chibuwe or Chisumbanje were the greatest concern lies, in the likely event of the tropical cyclone resulting in flash flooding at the scale of the havoc it has wrought in Mozambique…once again, this will be a litmus test for Zimbabwe’s preparedness to handle disaster situations, which, as a result of climate change, have become more frequent, intense and damaging”. And the Business Day newspaper based on Johannesburg, South Africa carried a story by Matthew Hill and Godfrey Marawanyika with Ana Monteiro from Bloomberg who noted, “The country is the third-most vulnerable on the continent to climate change, according to the Global Facility for Disaster Reduction and Recovery”. Two days later (March 20), reporters Tara John and Anna Cardovillas from CNN communicated that Amnesty International “urged authorities in Mozambique and Zimbabwe, countries that are prone to flooding, to adopt climate change policies that could reduce the impact of these events”, quoting Muleya Mwananyanda Amnesty International’s deputy regional director for southern Africa who declared, “As the effects of climate change intensify, these extreme weather conditions can be expected to revisit us more frequently. The devastation wrought by Cyclone Idai is yet another wake-up call for the world to put in place ambitious climate change mitigation measures”.